The Virgin Mary, hieratic and still, looks out toward the viewer while gently supporting Christ with her left arm. The smiling infant gazes lovingly toward her and playfully stretches out his arm, grabbing the edge of her gold-trimmed, blue cloak. The star over the Madonna's forehead refers to her title "Star of the Sea," the meaning of the Jewish form of her name, Miriam. The Virgin's rigid and formal pose reflects the icon tradition of the Byzantine Empire. The painting's format and the ornamental scroll on either side of the Madonna also find close parallels in Byzantine icons. 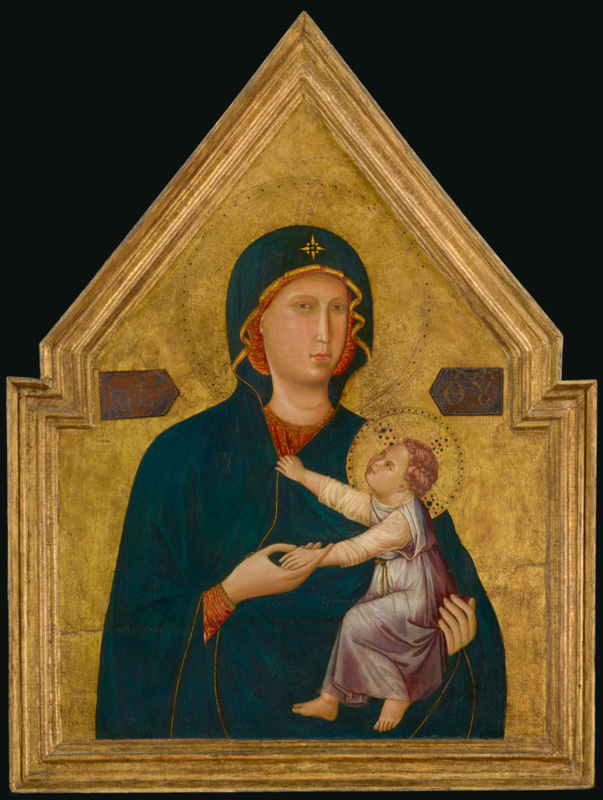 But unlike Byzantine work, the Master of Saint Cecilia emphasizes the intimate connection between the Madonna and Child, embodied at the Virgin's breast where her right hand gently cradles Christ's tiny left hand. This humanizing tendency would become increasingly prominent in Western Europe and a hallmark of Renaissance imagery of the Madonna and Child. Conte Augusto Contini-Bonacossi, 1878 - 1955 (Florence, Italy; Rome, Italy), by inheritance to his heirs, 1955. Heirs of Conte Augusto Contini-Bonacossi, 1878 - 1955, sold to a private collector, early 1970s. Stanley Moss (Riverdale-on-Hudson, New York; New York, New York), sold to the J. Paul Getty Museum, 2000. Coletti, Luigi. "La mostra giottesca." Bollettino d'arte 31 (August 1937), p. 67. Mostra giottesca, exh. cat. (Florence: Palazzo degli Uffizi, with Istituto italiano d'arti grafiche, 1937), p. 45, no. 118a. Sinibaldi, Giulia, and Giulia Brunetti. Pittura italiana del Duecento e Trecento: Catalogo della mostra giottesca di Firenze del 1937 (Florence: Sansoni, 1943), p. 425, no. 135, fig. 135. Longhi, Roberto. "Giudizio sul Duecento." Proporzioni: Studi di storia dell'arte (Florence: Sansoni, 1948), vol. 2, p. 53, no. 135. Sandberg-Vavalà, Evelyn. Studies in the Florentine Churches. Part I: Pre-Renaissance Period (Florence: Leo S. Olschki, 1959), pp. 66-67, note 11. Berenson, Bernard. Italian Pictures of the Renaissance: A List of the Principal Artists and Their Works: Florentine School. 2 vols. (New York: Phaidon Press, 1963), vol. 1, p. 144. Previtali, Giovanni. Giotto e la sua bottega (Milan: Fratelli Fabbri Editori, 1967; 2nd ed., 1974), pp. 57, 62-63, 333, fig. 89. Ragghianti, Carlo L. "Percorso di Giotto." Critica d'Arte 16 (March-April 1969), p. 72. Longhi, Roberto. "Giudizio sul Duecento" (1948). Repr. in Roberto Longhi, Opere complete di Roberto Longhi. Vol. 7, 'Giudizio sul Duecento' e ricerche sul Trecento nell'Italia Centrale, 1939-1970 (Florence: Sansoni, 1974), p. 51, no. 135. Offner, Richard, and Miklós Boskovits. A Critical and Historical Corpus of Florentine Painting: The Fourteenth Century. Sec. 3, vol. 9, The Painters of the Miniaturist Tendency (Florence: Giunti Barbèra, 1984), pp. 13-14, 131, pl. 1. Todini, Filippo. "Un'Opera Romana di Giotto." Studi di Storia dell'Arte 3 (1992), pp. 16, 22, note 56, fig. 16. Parronchi, Alessandro. Cavallini: "Discepolo di Giotto" (Florence: Edizioni Polistampa, 1994), p. 34n75. Kanter, Laurence B. "The Illuminators of early Renaissance Florence." In Painting and Illumination in Early Renaissance Florence, 1300-1450, exh. cat. Laurence B. Kanter, et al. (New York: Metropolitan Museum of Art, 1994), pp. 5-6, fig. 3 (in reverse). Tartuferi, Angelo, ed. Giotto: Bilancio critico di sessant'anni di studi e ricerche, exh. cat. (Florence: Giunti, 2000), pp. 119-20, fig. 5. Szafran, Yvonne, and Narayan Khandekar. "Varnish and Early Italian Paintings: Evidence and Implications." In Early Italian Paintings: Approaches to Conservation. Patricia Sherwin Garland, ed. (New Haven: Yale University Press, 2002), pp. 116-17, 119, fig. 7.7, nn27-28. Allen, Denise, et al. Masterpieces of Painting in the J. Paul Getty Museum. Rev. ed. (Los Angeles: J. Paul Getty Museum, with Thames & Hudson, 2003), pp. 8-9, no. 1, ill., entry by Dawson Carr. The J. Paul Getty Museum Handbook of the Collections. 7th ed. (Los Angeles: J. Paul Getty Museum, 2007), p. 86, ill.